We try and get together with our friends as often as we can, due to the fact that all our friends have kids this can sometimes be a challenge. But lucky for us we could all make it work this weekend. We all bring a dish and a libation of choice and the rest is history. I know these little get togethers really restore all our spirits after a long week. The dishes don’t have to be complex, so is the case in the pasta I brought. I really just made this up on the fly, I looked to see what I had on hand and all I had to buy was some whole wheat pasta. Good luck and I hope you Enjoy! *to toast nuts put them in a dry saute pan over medium heat just until they start to release there oils, you’ll be able to smell them become toasty. Shake pan occasionally, be careful not to burn. 1. Cook pasta according to the directions. Be sure to salt the boiling water. 2. After you have toasted the nuts, place them in the food processor with the lemon zest, pepper and parsley, pulse down to a fine grind. Use your best judgement on the size of the pulsed nuts. 3. Mix the olive oil and reserved lemon juice, whisk together. Season with salt and pepper. 4. When the pasta is done cooking drain and place back into the pot you boiled it in. Drizzle in the lemon and olive oil mixture, the nut mixture and the cheese. Using tongs toss all together and coat all the pasta. 5. Pour into a big bowl and garnish with any leftover cheese or parsley. 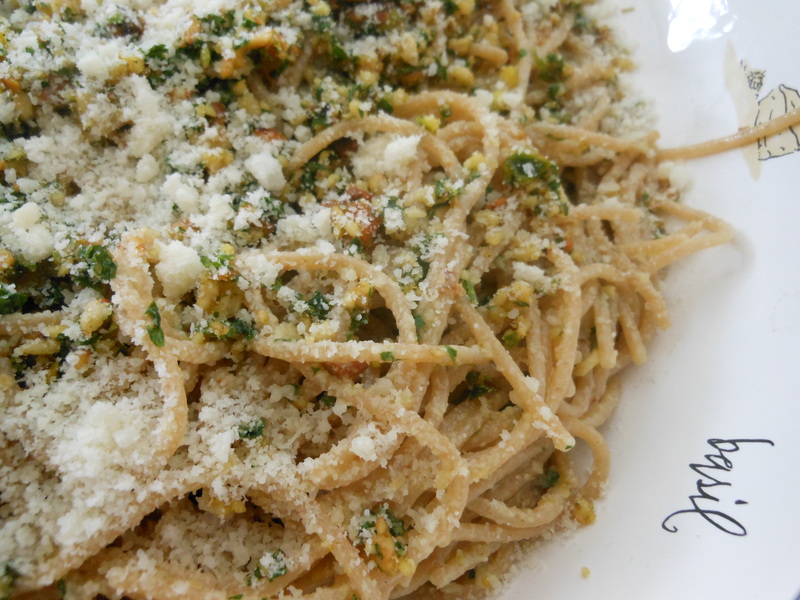 I liked the idea of this dish because we are getting whole grains from the pasta, good fats from the nuts and olive oil, and using fresh herbs and lemon bring a fresh flavor and take your taste buds for a ride. Parsley has a number of healing properties such as strengthening the liver, kidneys and the bladder. It’s also a immune enhancer and helps support the nervous system. How cool is that? Food should always taste amazing but also be nutritional dense, using whole foods will ensure this.